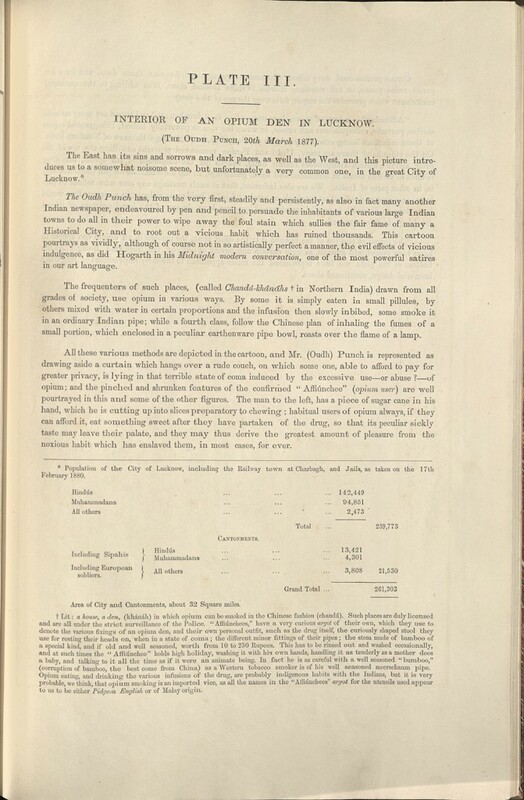 Punch, the seminal British satirical magazine, is credited with popularizing the use of ‘cartoon’ to mean a comic drawing, rather than a preliminary sketch for a painting or tapestry. During the time of the British Raj, a number of publications throughout India adopted Punch’s model of political cartoons and satirical commentary; the first of these was The Oudh Punch (also cited as The Awadh Punch), an Urdu magazine founded in 1877 and based in the northern city of Lucknow. Many others, such as The Delhi Punch and The Punjab Punch, followed suit. 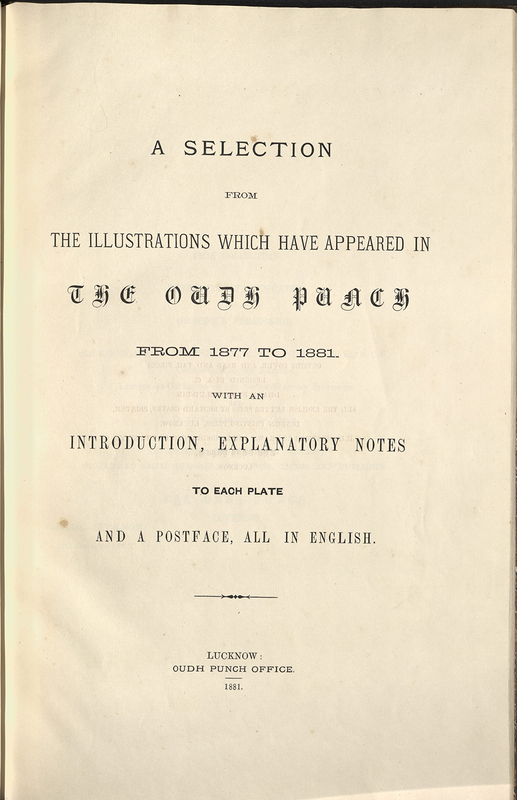 They employed the sardonic devices of the original Punch to skewer and criticize British imperial leadership; nonetheless, a British author, Archibald Constable, saw fit to produce this selection of cartoons with English explications, putting the cartoons forward as a cultural curiosity, and as evidence of the Indian sense of humor. 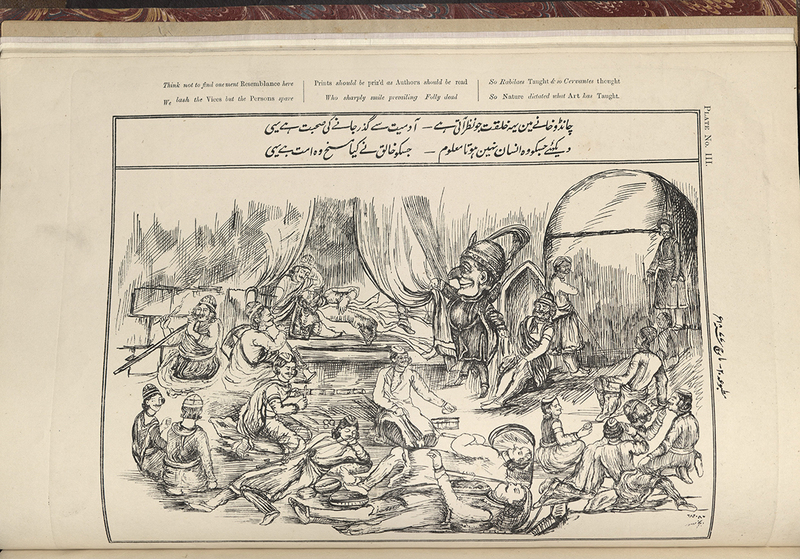 A selection from the illustrations which have appeared in the Oudh Punch from 1877 to 1881, then, is an interesting window into its period: original illustrations with Urdu text are accompanied by Constable’s English notes, which provide political and cultural context, and a general introduction and postface. Constable regards the cartoons with the optimistic authority of the colonialist; their original authors may have offered differing descriptions. The volume’s inclusion in the Santo Domingo Collection is on the basis of one of its plates: “An opium den in Lucknow”, which depicts the range of users from intoxication to catatonia; the Oudh Punch himself draws back the curtain on a prostrate opium eater. A selection from the illustrations which have appeared in the Oudh Punch from 1877 to 1881: NC1718.O8 1881.